This Presbyterian minister was called by some the first casualty of the Civil War. Certainly, his death on November 7, 1837 was over the primary issue of that War Between the States, namely, that of slavery. With the intriguing name of Elijah Lovejoy, the pastor of Des Peres Presbyterian Church and later, the College Avenue Presbyterian Church, was well-known in the twin states of Missouri and Illinois in the early part of the nineteenth century. He was the son of a Congregationalist minister, but Elijah only came to faith in Christ as a young adult, while sitting under the preaching of a Presbyterian preacher. No long after, he made the decision to attend Princeton Theological Seminary and was ordained in 1833, shortly after graduation. (See April 18th historical devotional). It wasn’t his ministry in the pulpit which was so controversial. Nor was it his service as the Stated Clerk of the local Presbytery. Both of these positions were acceptable to the church world, and unexceptional in the world at large. What set him up in notoriety was that he had organized the American Anti-Slavery Society in the area. He then backed up that organization as a newspaper editor of an abolitionist paper in both St. Louis, Missouri and Alton, Illinois. Both of these places were on the front line of this issue. Missouri was a slave state, even though all around her were free states. It was also the focal point of slave catchers who would enter into their confines to hunt down slaves who had escaped their plantations. In short, it was the center of both pro-slavery and anti-slavery factions in the population. And Elijah Lovejoy became the voice of the latter faction. Initially, reactions against Rev. Lovejoy’s work were aimed solely at the tools of his publishing trade. The pro-slavery citizens of the area simply responded to the good Presbyterian minister by destroying the printing press of his abolitionist newspaper, which effectively stopped him from printing either the St. Louis Observer or the Alton Times. Three times, his printing press was destroyed and its parts were scattered into the Missouri River. Each time, another press was located and the abolitionist newspaper continued to be published. As Rev. Lovejoy sought to prevent yet another attempt to hinder his work, his next printing press was moved to a warehouse building near the waterfront. This time a dozen or so law enforcement men were organized to guard it, assisted by Rev. Lovejoy, and his supporters. But the people who were determined to stop him were larger in number. There are varying reports of the ensuing skirmish. Some say that when Rev. Lovejoy tried to shove a ladder, placed there for the purposes of burning the two-story building, away from the structure, he was killed by a shotgun slug fired from the front of the building. Others say that he tried to reason with the mob on the ground floor before being shot. In either case, he was killed instantly in the ensuing gun battle. 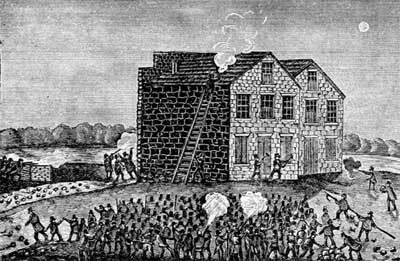 The printing press was again destroyed after his killing, and with his death, tensions continued to be inflamed. A later attempted prosecution in the courts failed to find anyone guilty. 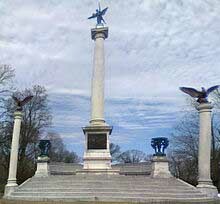 A monument was erected in 1897 in his memory, at a cemetery in Alton, Illinois. But in the ensuing years, and particularly with the heat of national crisis in 1861–1865, in many ways Lovejoy became little more than a footnote in the nation’s history. To this day there are certainly those who work to keep alive the memory of his work, but for most, it seems he is largely forgotten. Words to live by: Elijah Lovejoy had a firm conviction that the righteous God would overrule the sin of slavery, for the good of black and whites alike, to say nothing of His own glory. With firm conviction, this Presbyterian clergyman became a catalyst in print for efforts to put an end to the terrible institution. He paid the ultimate price for his stand against slavery. The church today needs godly men and women to take stands against the evils of our day. Will you be one who will answer that call for the Word of God and the testimony of Jesus Christ?